We really have been spoiled with good weather over the past few weeks here in Dubai. We were blessed with moderate temperatures (comparatively), clouds (don't really get to see that many throughout the year), and rain (even rarer if that's a word) more than once. However, I can feel my body slowly getting into summer mode. Hot soups and heavy meals have taken a back seat. Instead I could eat buckets full of vegetables either cooked or raw in salads. Now that can get boring after some time. The one and only way to avoid it (and to make boring vegetables taste great), is to spice them up. Not actually rocket science to figure that out, right? Dukkah is an Egyptian spice mix, made from nuts, seeds and spices. In order to increase flavor, they are roasted before blended in to a coarse-crumbly mixture. I made it once before and realized that almost everything can be spiced up with that: coat your chicken before grilling, sprinkle at over raw salads and cooked vegetables. Whatever seems a bit bland and can take a little crunch on top, heap on the Dukkah. For the past few days, I just grab whatever veggies I could find in the fridge, cooked them or made a salad out of it and sprinkled loads of Dukkah on top. One of my favorites has become green beans and mushrooms with Dukkah. 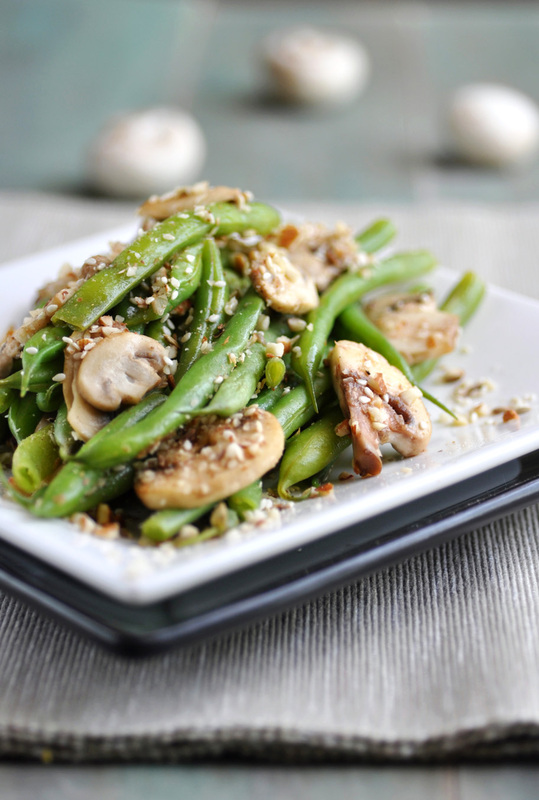 The Dukkah goes especially well with the mushrooms and the green beans add more texture. A really good side dish. Or lunch if you eat a bucketful of it, like I like to do. Steam green beans for a few minutes, until tender but still with some crispness. Put into ice water for a few seconds to stop the cooking process. Drain and set aside. In a large pan, melt butter over medium heat. Cook sliced garlic for a minute before adding sliced mushrooms. Cook for a couple of minutes. Add green beans, heat through the vegetables. Season to taste. Transfer to serving dish and sprinkle with dukkah spice mixture. Serve immediately. In a dry pan over medium heat, roast almonds for about 5-7 minutes. Set aside. In the same pan, combine sesame, cumin, coriander, fennel and peppercorns. Roast over medium heat, shaking the pan regularly, until fragrant, about 3-4 minutes. Set aside. In a food processor, pulse the roasted almonds until roughly chopped. Then add sesame, spices and salt and pulse until finely chopped. Transfer to airtight container.